On Sunday Sooz and I opened the Buy One Get One blasters I picked up from KMart, and we were both bored to tears. After opening a case of these neither one of us could really care less about these blasters. We opened the first one in about 1 minute, and there was nothing other than 2 Yankee Stadium Legacy cards. 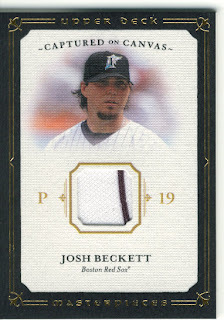 The second blaster had 2 Yankee Stadium Legacy cards, a Captured on Canvas Josh Beckett GU Jersey card, and 2 SP's, 101 Ripken Jr., and 103 Morris. The GU Beckett card is really annoying because he is pictured in a Marlins uniform, and the uniform in the card is clearly a Marlins one, and it has been years since he has been there. The card does state Red Sox, but why do it this way? Sometimes Upper Deck really makes me angry. I am seriously done with Masterpieces this year, these blasters were a fluke of a sale that I couldn't not pick them up. You didn't happen to pull another Jeter SP, did you? Can't find them anywhere! Sorry. There weren't many SPs out of the blasters. We got two out of the entire case. They weren't joking about being short prints.